Boating Accident. Image Credit: Marine Insight. With the amount of money you spend on your boat, imagine what you would do if you lose it in one sudden blow! Aside from being a hobby, your boat is an investment. And like all other investments, you’d want to secure it—this is why you might want to think of getting a boat insurance policy, in addition to your boat accessories and maintenance plans. 1. To deal with the increase in the number of boat owners, several US states and countries have now require watercraft liability coverage. This type of policy will cover all damages that the boater may incur in case there’s a collision with another boat. 2. The physical damage policy is easily what most boat owners want. 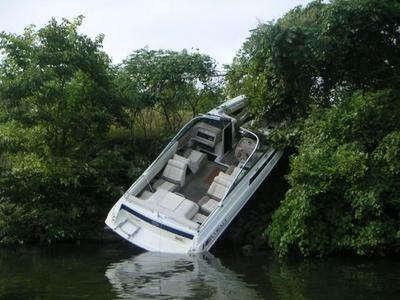 Any damage to the boat caused by the events specified in the policy will be covered by its equivalent amount. It may be an open insurance policy, in which case all scenarios will be covered, from disasters like lightning, storms, and hurricanes, to unfortunate incidents like theft or robbery. Some physical damage insurance policies also allow for the replacement of lost parts of the boat. 3. You should get a passenger medical policy, which will cover medical expenses of the boat passengers, in case they sustain any injuries while on the boat. 4. A roadside assistance policy is an optional insurance coverage, which covers towing problems when needed. Towing can be an expensive problem, and this type of policy will help buffer the costs. 5. In case of an accident caused by a collision with another boat, you, your passengers, and your boat will end up in trouble if the other boat is uninsured. This is where an uninsured boat policy comes to the picture. International Boat Building Competition at the Auckland International Boat Show. Image Credit: Auckland International Boat Show. Something huge is happening in Auckland, New Zealand this September 15 to 18, 2011. The largest boat show in the country, the Auckland International Boat Show, attended by thousands of local boating enthusiasts and tourists every year, will be held in the Viaduct Harbour, in Central Auckland, New Zealand. The exhibitor applications for New Zealand’s biggest boat show have far exceeded expectations. In fact, you can take a quick visit and check out if your favorite manufacturer will be at the show. True to its promise of being a gathering of the best exhibitors throughout the country, all exhibitor types are covered by the boat show—from parts and accessories, waterskiing, navigation devices, safety, and electronics, to buoys and fenders, motor boats, boat trailers, sailing boats, and dinghies. Around 150 exhibitors all in all will be at the show, with as many as 200 boats to be exhibited. The event is sponsored by several companies with the common goal of strengthening the influence of boating in New Zealand. Kia Motors, Total Floating Systems Ltd, Panasonic, Line 7 and The Moorings will be sponsoring the Auckland International Boat Show, with Boating New Zealand and Auckland as the gold sponsors. Arguably the main highlight of the event is the International Boat Building Competition, where 12 companies will build a boat inspired by a randomly selected country, such as New Zealand, Australia, France, South Africa, England, Scotland, Italy, Argentina, Japan, and Wales. The competition aims to raise awareness on the competency of local companies in building the best boats in the industry. Two boats will be built by each participant, one which should be finished before the start of the boat show and another to be assembled on the event dates. On the final day, there will be a racing on a course specifically designed for the competition. This competition will surely be a breath of fresh air, and is bound to showcase the world class talent of New Zealand in boat building! On Saturday evening, the Australia’s second RWC game will be rounded up, as Australia and Ireland will meet in Auckland. For tickets, you can either get a single day pass (valid for any day) or a four day pass. You may also get a family pass: book 2 adults and up to 3 children tickets all at once and you will be eligible for a discount; you will only need to pay $38. Boating enthusiasts both local and international can’t wait for this exciting boat show in New Zealand. As one of the relatively new boat shows, the Auckland International Boat Show is bound to be a breath of fresh air! 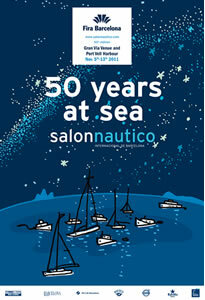 Salon Nautico Poster. Image Credit: Salon Nautico. The biggest and most important boat show in Spain, attended by visitors all over the world and known for presenting the most innovative products in the industry, is celebrating its 50th anniversary. The Barcelona International Boat Show, as always, will be featuring the most extensive products for culture, leisure, and competitive boating. The show takes place from November 5 to 13 in the Gran Via Exhibition Centre in Muelle Espanya del Port Vell. Completely open to the public, this professional event cuts across all sectors in boating—from accessories and nautical clothing to dinghies and motor boats. At Port Vell is an elaborate floating exhibition, and on display are the best large vessels and mega-yachts from across the world. Aside from the promise of the best and latest in the marine industry, the Barcelona International Boat Show has designated areas for interaction, leisure, information and various activities. Visitors can also drop by the Fun Beach, where there are water sports for everyone to enjoy—windsurfing, dinghy sailing, and kite-surfing to name a few. The Fisherman’s Zone is where aspiring fishermen and boaters can get a crash course on fishing tips. There are also plenty of seminars held throughout the day in the Marine Zone. There will be sailing and fishing simulators and a pool for dinghy-sailing beginners. Totally safe and contained, the pool will help you to finally start learning dinghy sailing! The presentation of several regattas to be held in the succeeding months will also be announced in the boat show. The first Barcelona International Boat Show was held in 1963, with the original goals of promoting the Spanish maritime industry and encouraging more people to become seafarers. In the last fifty years, not only has Barcelona International Boat Show reached these goals, it has even surpassed them—setting a golden standard for being one of the best commercial platforms for propellers, boat engines, and other equipment around the globe. The 50th INTERBOOT International Watersports Exhibition—a Boating Show Like No Other! Interboot Logo. Image Credit: Interboot. From September 17 to 25, 2011, one of the most widely visited and biggest boating exhibitions will be held for the 50th time—the Interboot International Watersports Exhibition in the Interboot Harbour, on the Friedrichshafen lakefront. With its wide exhibition space and open ground, the Exhibition Center is a great venue for a large-scale boating show like this one. In fact, the 50th International Watersports-Exhibition will have as many as 500 exhibitors coming from 15 different countries, with the common goal of providing the best and most innovative sailing boats and ships in the marine industry. The event will be covered by 421 media representatives, so the print, television, radio and online coverage of the event will be just as extensive. With the opening of the Interboot Diving Center, diving schools, destinations, and traders will be available to answer any questions one may have. Trial diving, which is open for as many as 350 participants, will allow both children and adults to tap into a possible hobby of theirs. All that’s required is an interest and great physical health, and you’re ready to dive! For boaters and exhibitors, the main highlight is the Harbour, divided into two: the Test Harbour, and the Sport Harbour. The Test Harbour will allow visitors to test boats directly in action. The Sport Harbour is where elite regattas and top-line ships can be found. There’s also a Maritime Travel Center, where visitors can book an event and a hotel room, and can go to their destination of choice! Participation and interactivity in this exhibition set it apart from other boat shows. With around 500 events for visitors to participate in, even those who were just tagged along by their boater friends are guaranteed to have fun! If you are planning to join the event, you can even bring your boat with you. There are several water sports destinations around the area, as it is right at the center of Austria, Switzerland, and Southern Germany. You can engage in your favorite water sports along with other experienced locals. For exhibitors, this is great news, as their products can reach markets in the three areas! The Anna Mae. Image Credit: Alison Chadwick via the West Highland Yachting Week. From July 29 to August 5, over 1,000 competing yachts will take part in the second largest regatta in West Coast, Scotland: the West Highland Yachting Week. The regatta is celebrating its 64th anniversary, making it one of the most historic sailing events throughout Europe! From first time racers to sailing experts, this regatta is open for everyone with a passion for sailing. The format of this race is ever-changing, with different fleets moving from different directions until they finally gather at the Oban on Sunday. They will race out of Oban for two days, with the challenge of having to withstand narrow channels and natural hazards. By Wednesday, the yachts will have to go past the strong winds and waves in Tobermory. Tobermory is in itself a place to behold, with great sights and fancy shops that will allow yachts to restock. Sounds exciting enough? Aside from the regatta, the West Highland Yachting Week has several activities for the sailing enthusiast, such as the Free Family swim night at the Atlantis Leisure Center on Tuesday (August 2), the early evening barbecue party at the Oban Sailing Club (August 1), and the opening party at the Craobh Marina and Lord of the Isles Pub and Restaurant on Saturday (July 30). The first West Highland Yachting Week dates back as early as 1882—when the Royal Highland Yacht Club organized its first regatta for two classes—those under 40 tons, and those over 40 tons. Also, what makes this historic event so unique is its blend of tradition and fun. Aside from yacht racing, it also introduced rowing races and the ‘Duck Hunt’, a pursuit race of some sort. 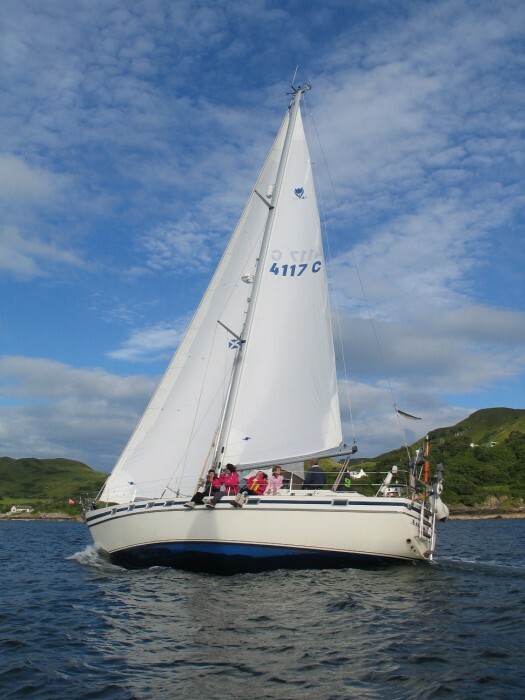 By 1947, the regatta became a joint effort of the Royal Highland Yacht Club, the Oban Sailing Club, and the Western Isles Yacht Club. Each club spearheaded two days each of the six-day regatta. The smooth administration of the West Highland Yachting Week today is a result of the Joint Regatta Committee’s management. The committee comprises five members of each club. Today, the regatta is made possible not only by the efforts of the Joint Regatta Committee but also by various clubs, such as the Clyde Corinthian Yacht Club, Inverkip Marina and other organizations. This regatta has several classes, which accommodate the racing amateur. If you’re up for some fun and competitive yacht racing, and you’re within the area, it’s time to clean your props and set sail for West Coast, Scotland! Crimson Pirate. Image Credit: Warner Bros.
Planning to have a movie night with your sailing buddies? Several sailing movies have been earned the respect and praise of boating enthusiasts themselves. Here are five movies that will inspire the boater in you. 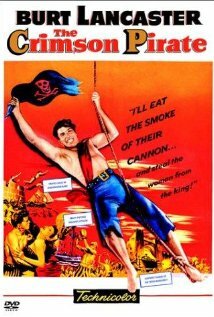 Crimson Pirate tells the adventures of Captain Vallo, a Caribbean pirate named Captain Vallo was caught in a conflict between the rebels and the King’s navy when he unexpectedly captures the navy crew led by Baron Gruda. After striking a deal, Vallo agrees to let Gruda go and capture the rebels in exchange of a sizable amount. Will Captain Vallo persist in his plan, or is it no pirate’s business? This 1952 movie is not only light-hearted, but it is also a feast for the boater’s eyes! Haven’t caught anything worth bragging about lately? Perhaps you’ll be able to relate to The Old Man and the Sea. For the past three months, an old fisherman hasn’t caught anything, until he finally hooks a great big fish. Landing it, however, is not without challenges, as the fisherman is put through a series of trials that will ultimately test his seafaring skills. The story is a great narrative of patience and perseverance. Like the previous film, the Riddle of the Sands is based on a classic novel by Erskine Childers. The plot, which involves two British boaters on a mission to stop a German scheme to invade England, is an absolute visual delight; you can’t miss the beautiful location and the authentic boats used throughout the film. Rae, played by Nicole Kidman, hasn’t gotten over the loss of her child with Ingram. The predicament of the couple prompts them to take a holiday aboard a dazzling yacht. The two are later joined by a mass murderer, Hughie, who has a plan to take control of the schooner. Will Hughie succeed? How can Rae overcome her grief just in time to save her husband from the killer? Dead Calm is a gripping thriller that takes place in a beautiful yacht—perfect for boaters looking for a good scare. Wind is set in the context of the historic Americas Cup in 1987. After losing in the esteemed regatta, Will Parker forms his own group in an attempt to win back the championship. While keeping his focus and determination on the prize, he reconciles his feelings for Kate Bass. Are you an avid fan of boating races? Then this movie will keep you on your toes! This list is by no means comprehensive; but what they do feature are immaculate boats, equipment and scenery. What are your favourite boating movies? PSP Southampton Boat Parade. Image Credit: PSP Southampton Boat Show. Pack your bags for one of the biggest boat shows in UK every summer: the PSP Southampton Boat Show. From September 16 to September 25, this boat show will take you to memorable sights and exciting experiences. This year’s PSP Southampton Boat Show will be even larger and more momentous than the previous one, so make sure you don’t miss it! With several activities to engage in, every pound you spend on your ticket will be well worth the price. The Boat Parade is sure to be a stunner—with modern and vintage boats cruising the marina as often as three times a day. Make sure you’re on the best spots for viewing these super boats, such as at the Mariners Restaurant, the Solent Park, or the outer reaches of the marina. If you’re a self-confessed boating amateur, or you really just want to understand boating better, then head on to the boat clinics. You’ll get the best advice from experts themselves, including safety at sea (organized by The Royal National Lifeboat Institution), top tips for racing sailors (Jim Saltonstall), kayak fishing (Andy Benham), and hybrid propulsion (Hybrid Marine). Taking your family with you is a fantastic idea! They can get out on the water, and feel the same thrill you do whenever you’re on the sea. There’s a Try-a-Boat attraction and a Get Afloat activity that will allow your children to get on a boat, complete with safety equipment. You can also take your loved ones to luxury boat rides or perhaps walk the marina for a romantic date. The attractions of this year’s PSP Southampton Boat Show are aplenty. There’s also the Sea Kitchen Theatre, the Team Racing event, and the Ladies Day. Just when you think you’ve run out of things to do in the boat show, you’ll be surprised that something even more exciting comes along. You can even win free tickets to the show. All you have to do is fill the competition entry form. By signing up, you have the exciting chance of winning one of five pairs of standard adult entry tickets for the show. The winners will be drawn on September 8, so it’s best to register ahead of everybody else! Getting to the event is quite easy: you can take the bus, the coach, or the train. If you’re taking the ferry or the plane, there are instructions in their website that are quite easy to follow. You can also book your tickets online.